Jim Street passed away on November 29th 2017. His amazing collection is currently being sorted and cataloged. Part of the Collection, the Golden Sahara and the Kookie T have just been uncovered. In November 2010 Palle Johansen and me went on our Jack Stewart Ford Research trip. Palle had recently become the new owner of the Jack Stewart Ford and we thought it was a good idea to try and visit the previous owners of the ’41 Ford, who were all in their 70’s and 80’s by then. One of the people we visited on that trip was Jim Street (Jim Skonzakes) in Dayton Ohio. Jim had owned the Jack Stewart Ford for a few years after he had bought it from Jack Stewart in 1951. We met Jim in the Radar Security building in Dayton. In the previous years I had been in contact with Jim on the phone about the Golden Sahara, the Jack Stewart Ford and many other things in his large collection. Jim had told me about the Radar Security business and how it came from all the electronics Jim and Henry Meyer had developed for the Golden Sahara. 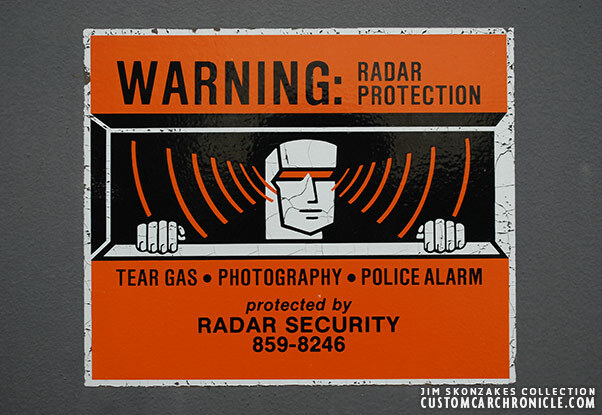 Jim ran the Radar Security business for over 30 years. By the time Palle and I visited Jim in the building it had been closed down as the security business, and he used the building as storage for part of his collection. 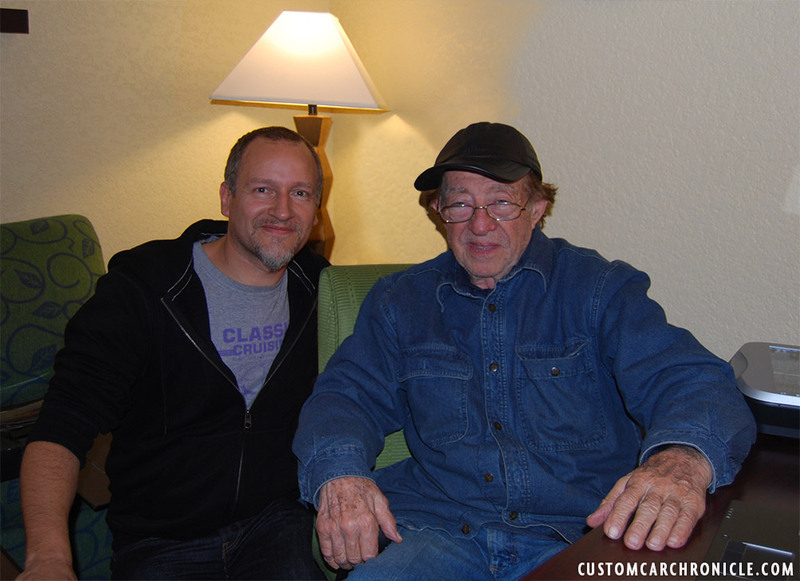 Jim Street on the right with Rik Hoving in 2012. When Jim opened the doors for us the first thing we saw was the Kookie T…. 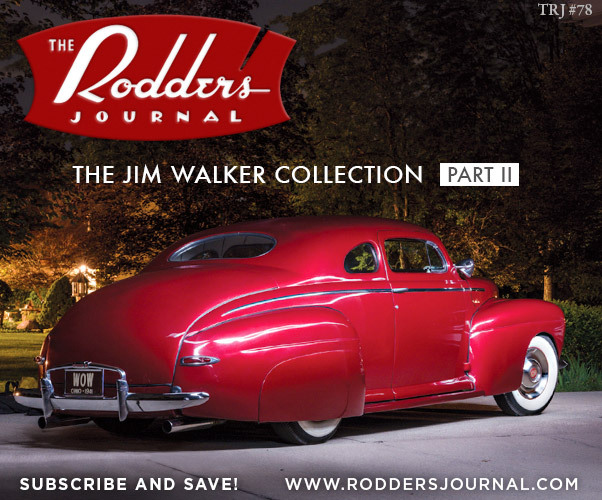 We were speechless, we had of course hoped that we would see some of Jim’s famous cars, but since we were there for the Jack Stewart Ford, we had no high hopes for anything else. And now we were standing next to the Larry Watson pearl painted and candy red flamed Kookie -T (formerly owned by Norm Grabowski). 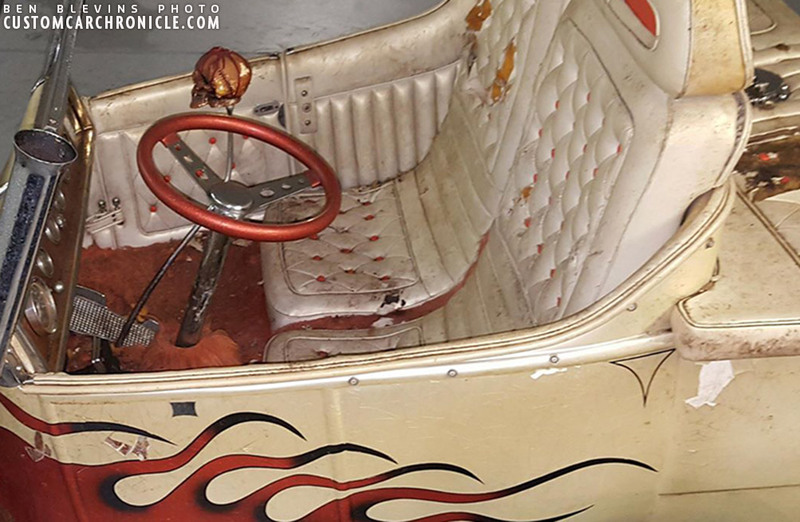 It looked amazing… the interior was damaged by mice or other rodents., and part of the paint was blistering, but what an amazing feeling to be able to touch this famous Hot Rod. On the floor there were a few pearl white paint chops that had fallen off. I asked Jim if it was okay for me to take those home. Sure he replied. Sadly the chips completely vaporized on the flight back home. 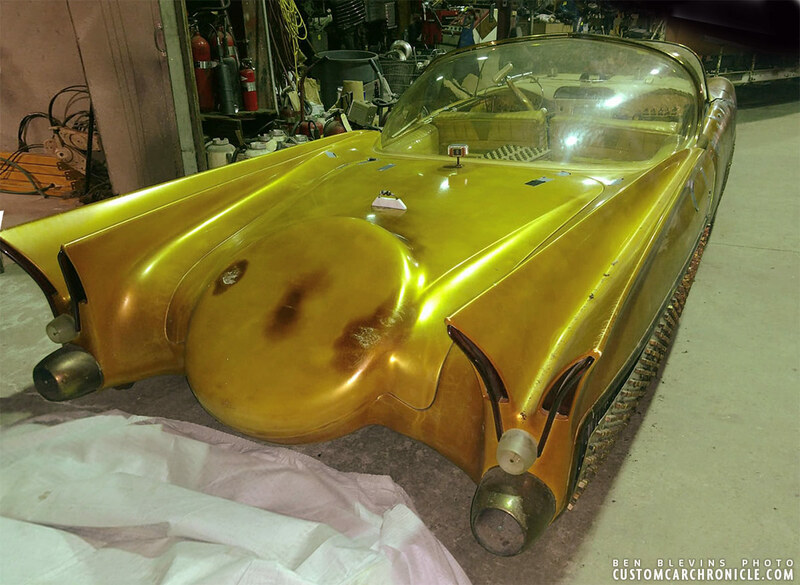 We talked to Jim about the Jack Stewart Ford and many other things… and of course we asked Jim about the Golden Sahara. He could not show us the car at the time, since it was covered up, with several tarps, all taped around the car to seal it completely. 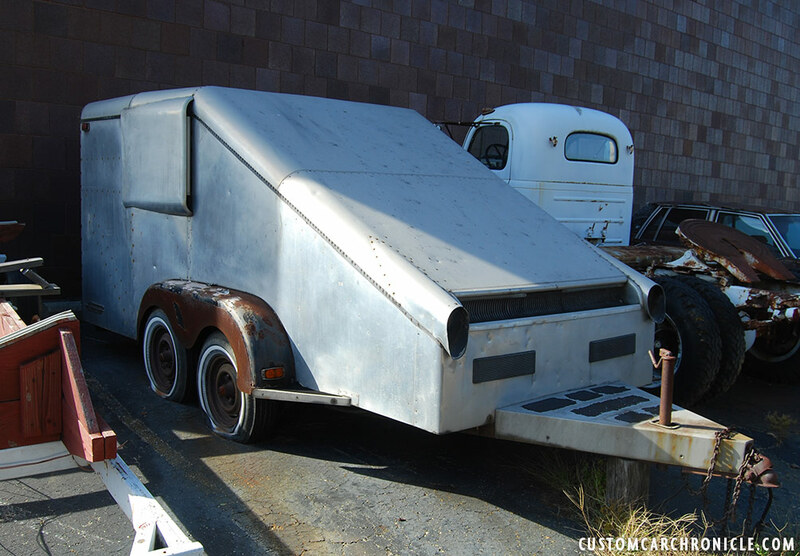 In 2010 the Kookie T Custom made trailer was sitting outside the Radar Security Building. In 2012 I visited Jim once again. By then I was working on the Jack Stewart Ford book, and I wanted to interview Jim more about all his cars and boats for the chapter on him in the book. 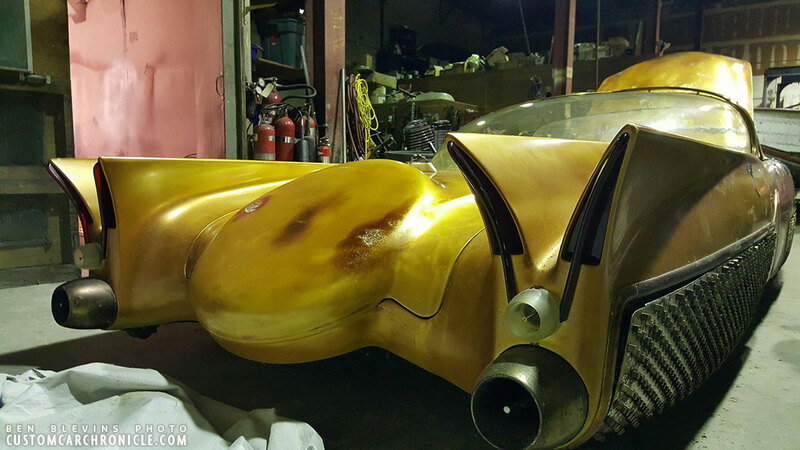 I spend an amazing week with Jim, in which he shared the complete history of the Golden Sahara with me, as well as many other cars in his collections, the boats and all the details he remembered about the Jack Stewart Ford. One day went by his house and I was walking around his garage, and looking inside to see the contours of the Golden Sahara inside the garage… I was just a few feet away from the Sahara, and now I also understood why he could not show it. It was meticulously wrapped and stored in a way that the tires were off the floor. 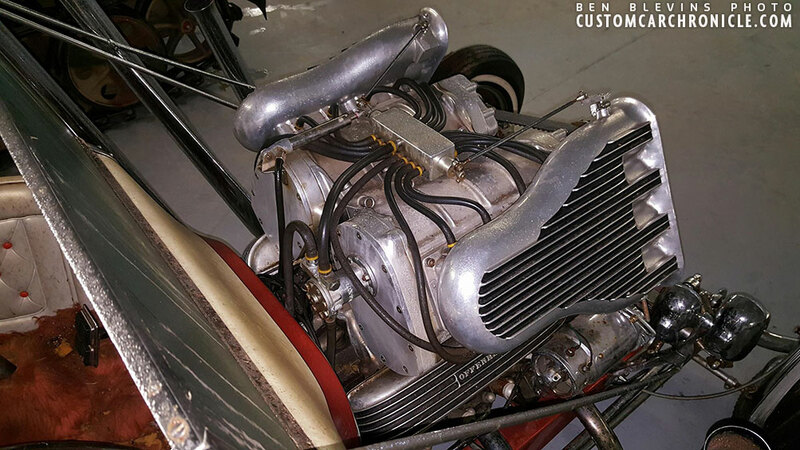 So close… and still not able to see the one of the worlds most iconic Custom Cars of all time. In the years that followed I spoke to Jim on a regular base and Jim mentioned that he had several overs turned down for the Golden Sahara and Kookie T over the years. There were moments that he thought about letting them go, but most of the times he knew he had to hold on to them. 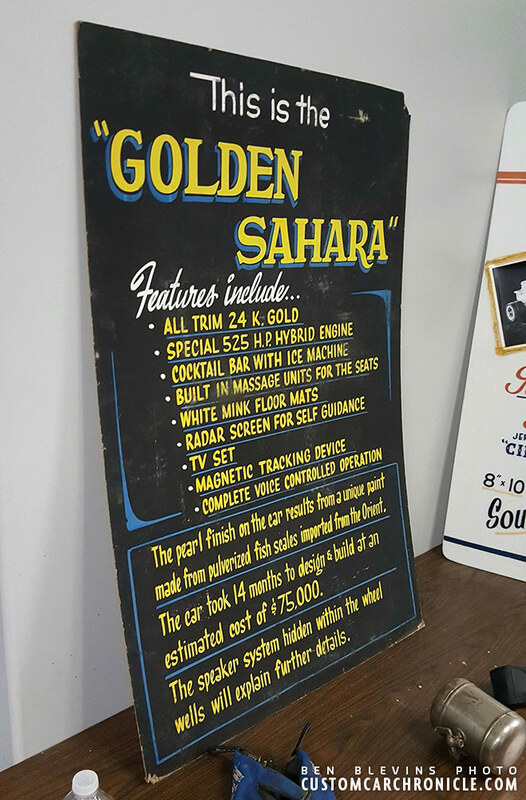 Especially the Golden Sahara was his baby and he did not want it to end up in the wrong hands (what ever that might be). Jim was starting to have some health issues in the last couple of years, but most of the times he had good spirits and loved to talk about the past and how he had created all the special things on the Golden Sahara, and how he mentioned all the people involved in creating it. After I heard that Jim had passed away on November 29th, I knew it was a matter of time before the cars would be uncovered. 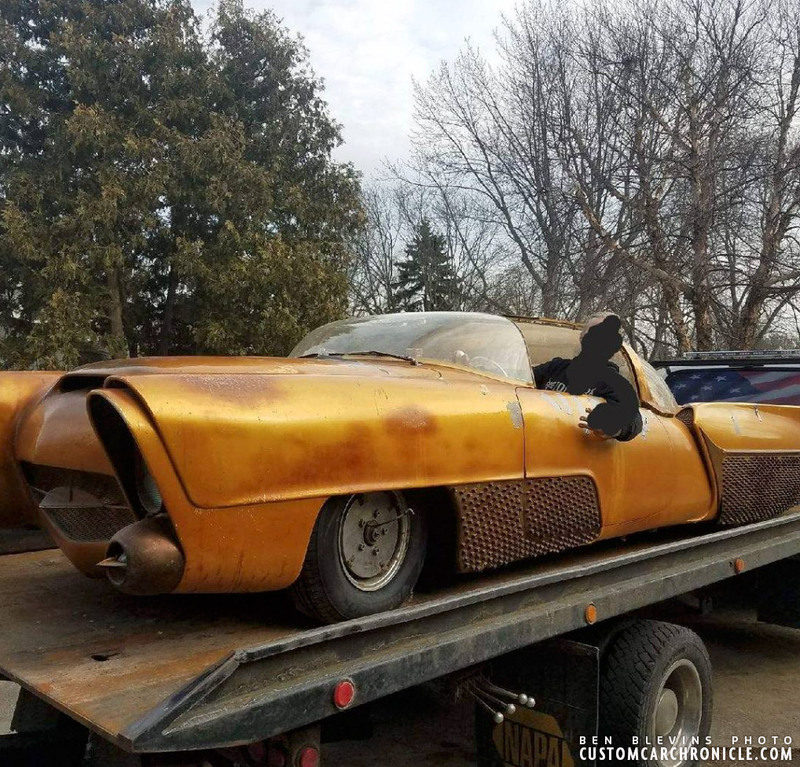 Jim had never mentioned where his cars would go to after he would be gone, and since he has quite a large collection I already figured they might end up at an Auction sooner or later. This is a very exciting day, to see the Golden Sahara and Kookie T for the first time in so long. 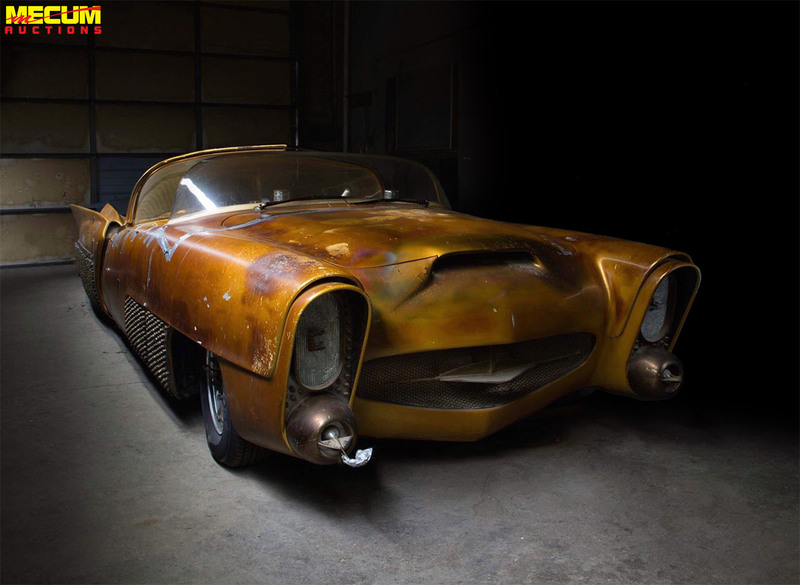 But at the same time it is a very sad day as well, since it reminds me of my friendship with Jim, and how he loved to talk about his Custom Car Creations. 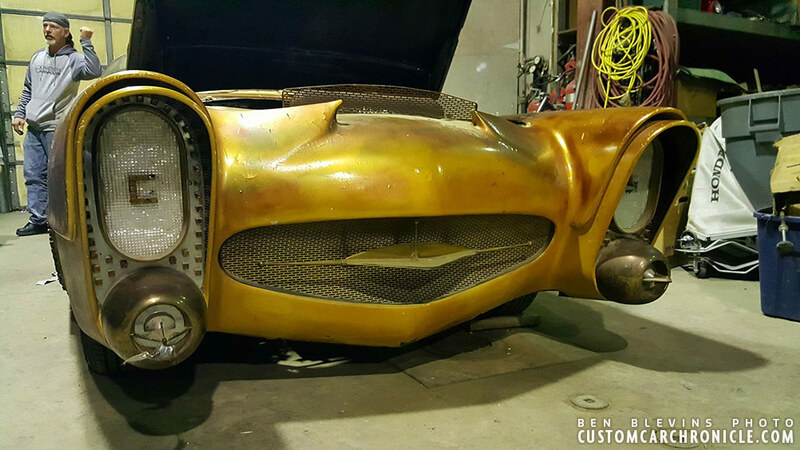 More on Jim in future Custom Car Chronicle articles. 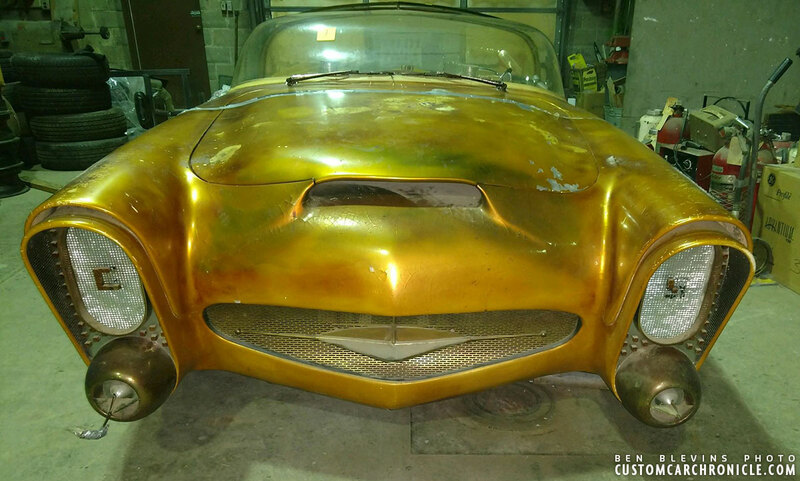 The Golden Sahara Kookie T and others will be auctioned in May, 2018 at the Indianapolis Mecum Auction. The Golden Sahara auction will include a lot of original receipts from 1958-and early ’59, as well as original photos. The Golden Shara outside for the first time in several decades. 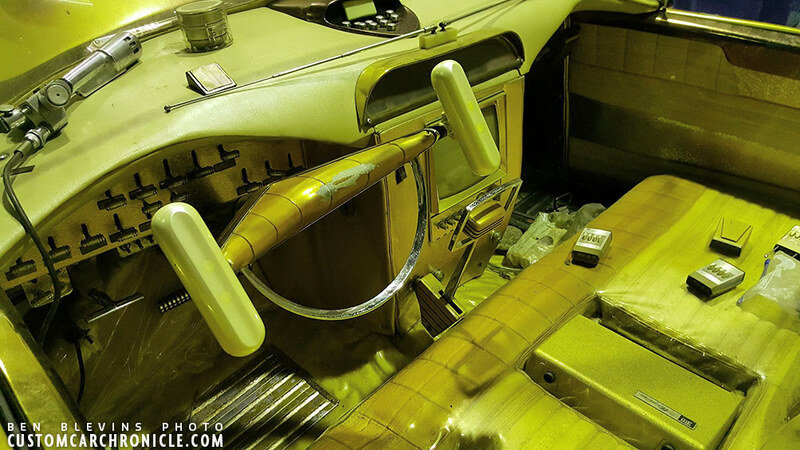 The second version of the Pearl Paint applied around 1959 has turned yellow and brown. Most likely caused by the clear used to mix in the pearl paste. The special custom made hubcaps are partly disassembled. The finned center section is missing in these photos, but they are still with the car. The Good-Year glass tires disintegrated when the car was unwrapped . Ben Blevins was a lucky man to have a good friend of him helping out sorting the Jim Street estate. 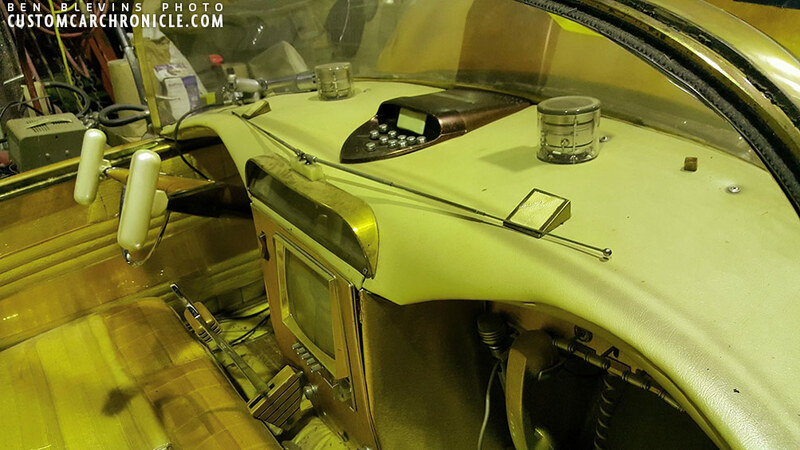 In March 2018 the Golden Sahara was unwrapped in the garage and moved outside for the first time in decades. It was later moved to the Radar Security building. Ben’s friend invited Ben to check out the collection and Ben shared some of the photos he took with the Custom Car Chronicle. This is the moment all Custom Car Enthusiasts from all over the world have been waiting for for so long. 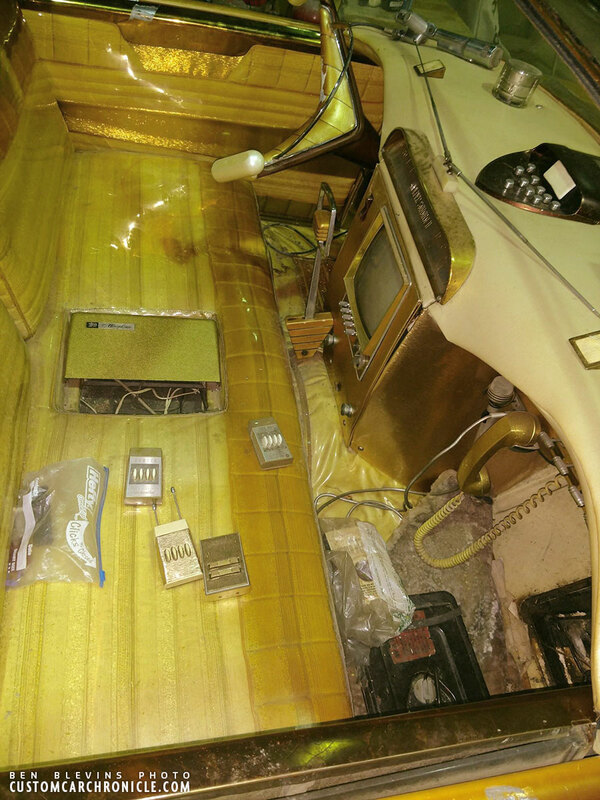 lets enjoy the photos of the Golden Sahara II and the Kookie-T seen for the first time in decades. Ben took this photo after the Golden Sahara had been moved into the Radar Security building. 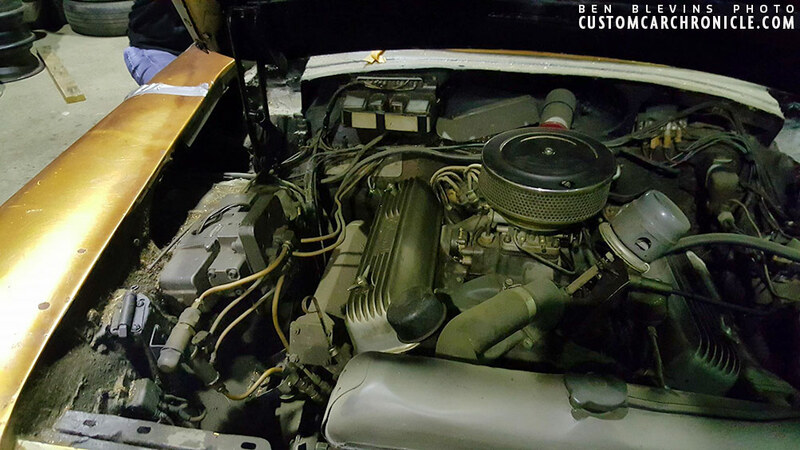 The car looks amazingly complete, and in very good condition.. apart for the yellowed paint. It makes me wonder how well the paint will clean, and if there perhaps it are multiple clear coats that could be carefully sanded to take away some of the yellowing. The front of the scoop shows some cracks in the paint. The Golden Sahara never looked this gold before. 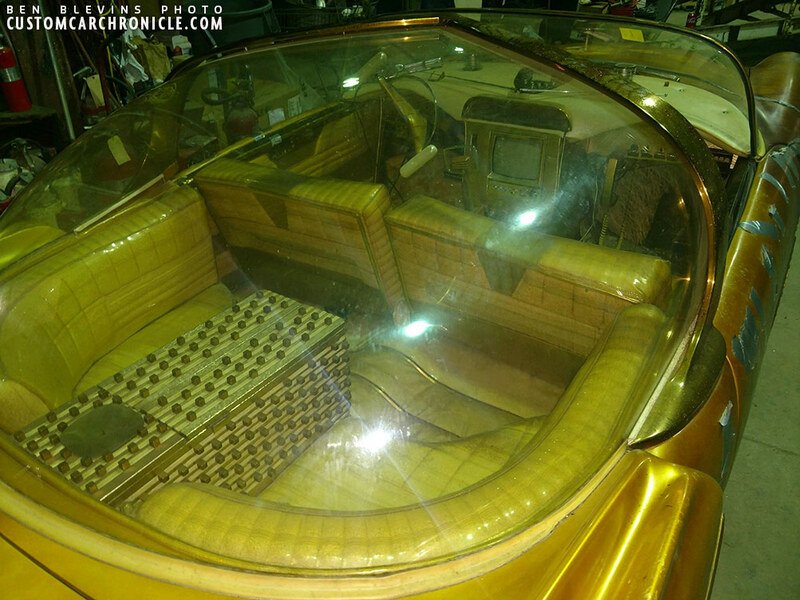 The hand made bubble top looks to be in excellent condition, and so does the rest of the interior. Everything is still there. 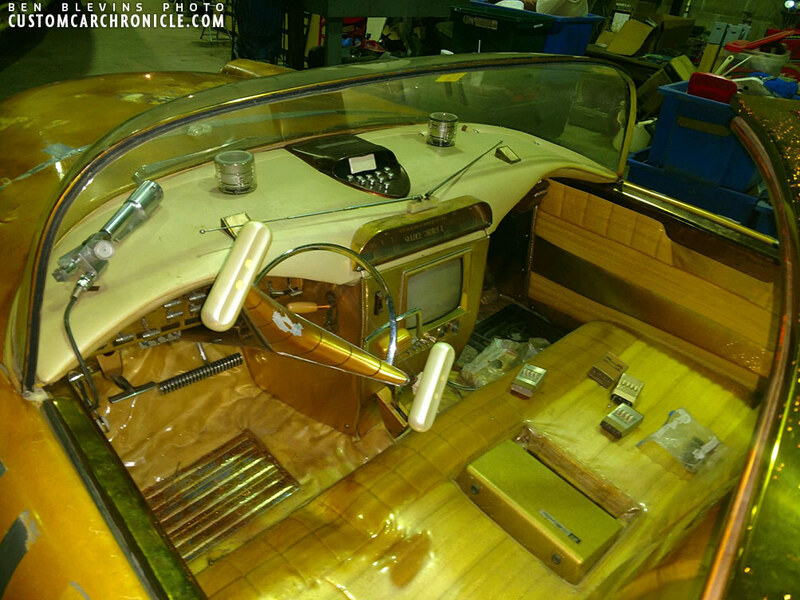 The phone, the TV, the Special steering wheel, the laminated shifter and the ’58 Ford hood scoop on the dash. 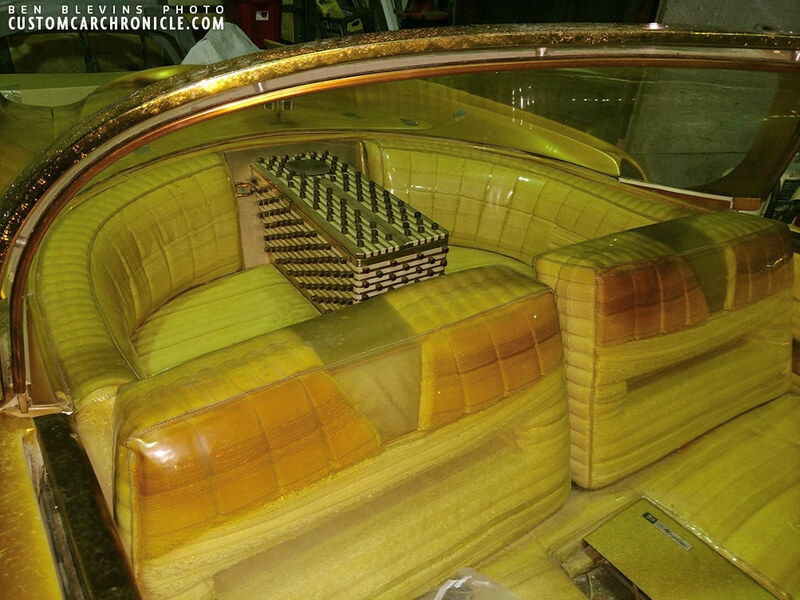 The original Golden Sahara already had a beautiful wrap around rear bench, created by the Carson Top Shop. For the Golden Sahara II jim had everything redone, including the custom made box, cocktail bar in the center which included among many other things a small fridge. Sadly Jim forgot who did the upholstery on this version of the car. A 1957 Chrysler steering wheel was modified to create the aircraft type steering wheel. Bob Metz created the twin-fin rear fenders. 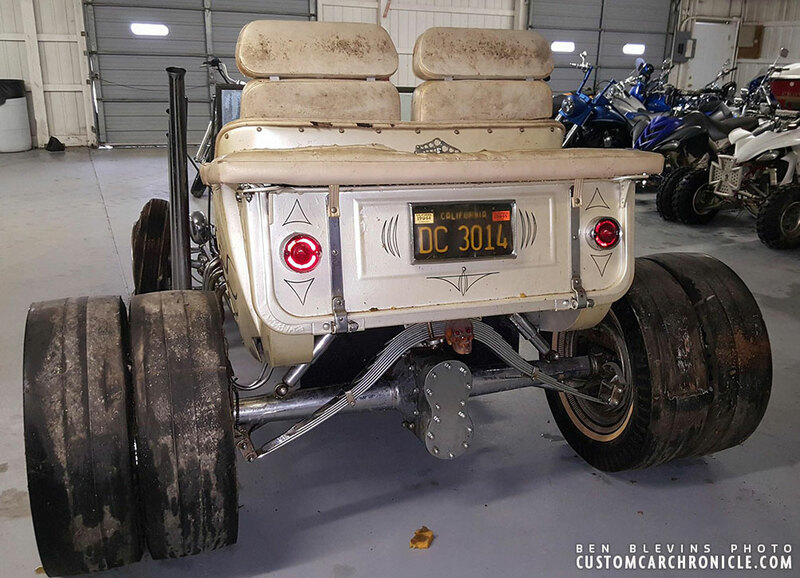 The Delphos Machine & Tool shop assisted in creating the unique taillights. Unique to see the rear fender skirt panel with the top corner loose. The buttons on these panels are 1957 Chrysler Radio buttons. Hood open on the Golden Sahara… for the first time I see that. 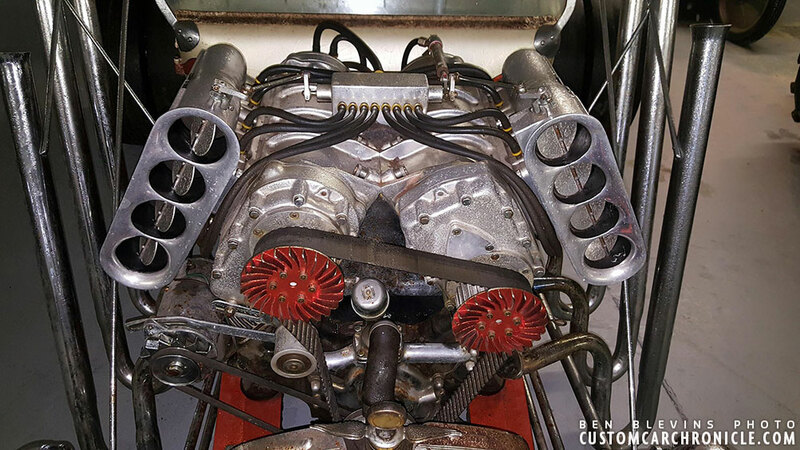 This is the first time I see the 525 HP engine of the Golden Sahara. 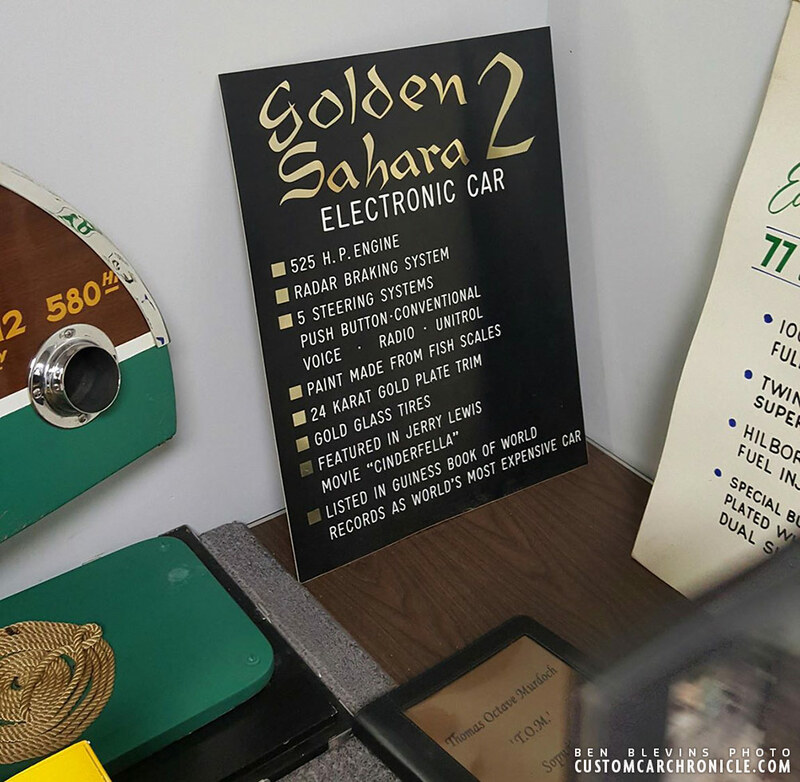 Over the more than a decade Jim had showed the Golden Sahara he had a good number of shown signs created to be displayed with the car. The last time I talked to him he mentioned he still had most of them stored away in the Radar Security building, but he had no idea where exactly. 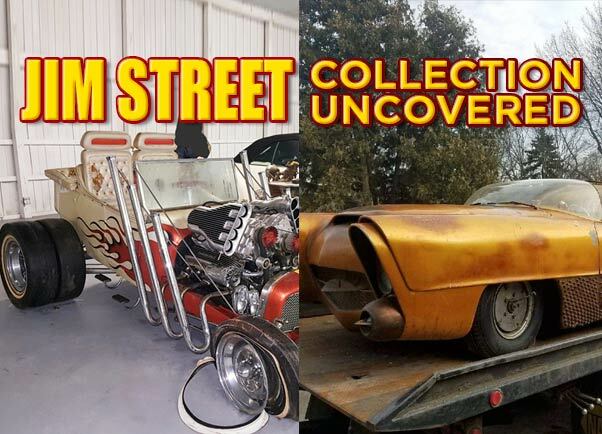 It looks like some, perhaps all have been find while searching the Jim Street Collection. Good to see these signs. 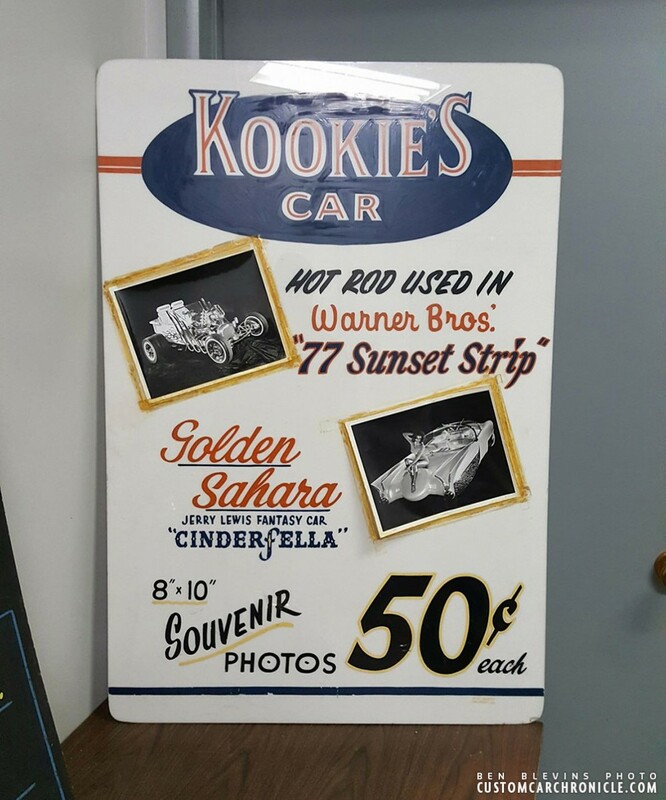 Jim was a fine business man, and one way of generate some extra travel money with the Golden Sahara and Kookie T was to sell photos of the cars at the shows they attended. 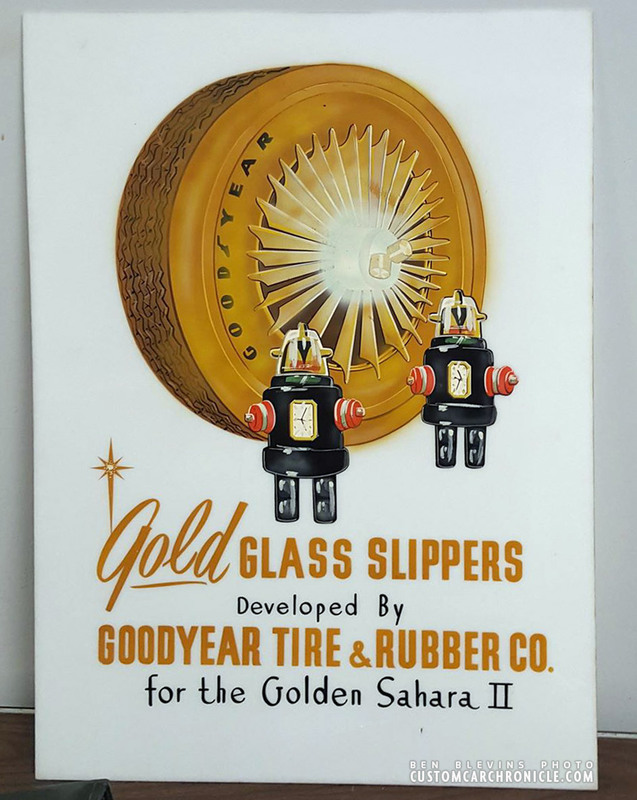 Very nicely done sign especially to promote the GoodYear illuminating tires which Jim named Gold Glass Slippers (which must have been inspired by the Cinderfella movie in which the Golden Sahara stared) Also showing is Robbie The Robot, Jim loved this toy and always displayed a dozen or two of the robots with the car. When Palle and me saw the Kookie T in 2010, Jim mentioned it just came out of storage. 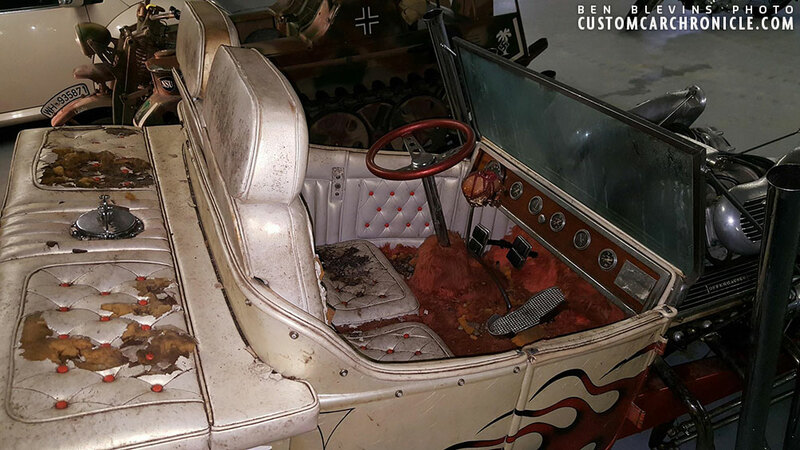 He mentioned that the place where it had been stored was supposed to be mice and other creature free, but when he inspected the car in 2010 he unhappily found out that the interior had been heavily damaged by critters. So he decided to take it home and make sure it would not get any further damage. The Kookie T at Larry Watson’s shop around 1960. The Kookie T still wearing its ’60’s pearl white and Candy flame paint job. The front white wall tires did not hold up as good as the double slicks on the back. 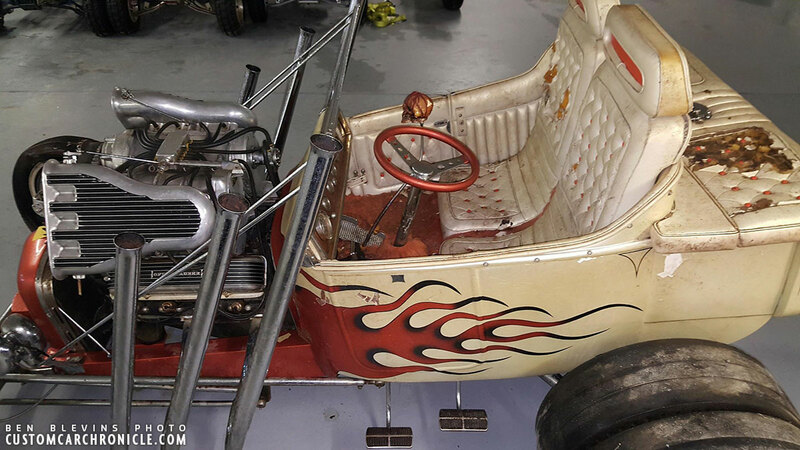 Take a look at the pearl paint on the Kookie T which was applied around 1960. It is surprisingly in a much better color shape than the pearl on the Golden Sahara. Which was clearly created with a different, a lot less durable type of clear base. When Jim picked me up from my motel in 2012 the first day, we drove to a local shop where Jim had one of his latest projects he was working on. A mild Custom ’49 Buick. 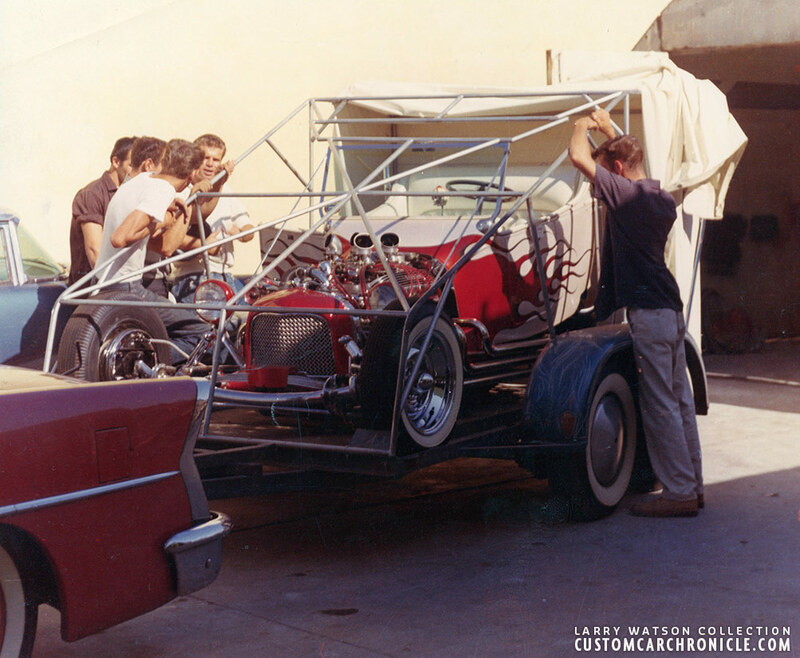 He had some custom trim plans for the car as well as a few other neat ideas. The car will also be part of the auction in May, 2018. Many thanks to Jim for being a great friend for the 12 or so years we have been in contact. I loved listening to you talking about the Golden Sahara and the Kookie T, as well as all the other stories you shared. I knew this day would come sooner or later, and wish it had been later, much later. I often told Jim that the world would go wild if the Golden Shara would be shown again, not matter in which condition. And Jim always replied that he would only show it in perfect condition like he did when he showed the car in the mid 50’d to late 60’s. And that it most likely would not happen in his lifetime. Now see what happens on March 13, 2018, the Golden Sahara and the Kookie T are uncovered on the internet for the first time… and the world goes wild. I really wish Jim could have been here to see it happen. Going to be an Interesting auction. Hopefully someone will post up more details about it as they become available. Thanks Rik, It is sad that Mr. Street passed away. I know he had a passion for these cars. I hope they end up with someone who cares enough about the history to do right by them. I hope so too. So does Sally. Just to be known, Ben Blevins took those photos and spread them around without Sally’s permission. Everyone was trusted to keep the car secret until Mecum started the advertising. Sally is upset over it. 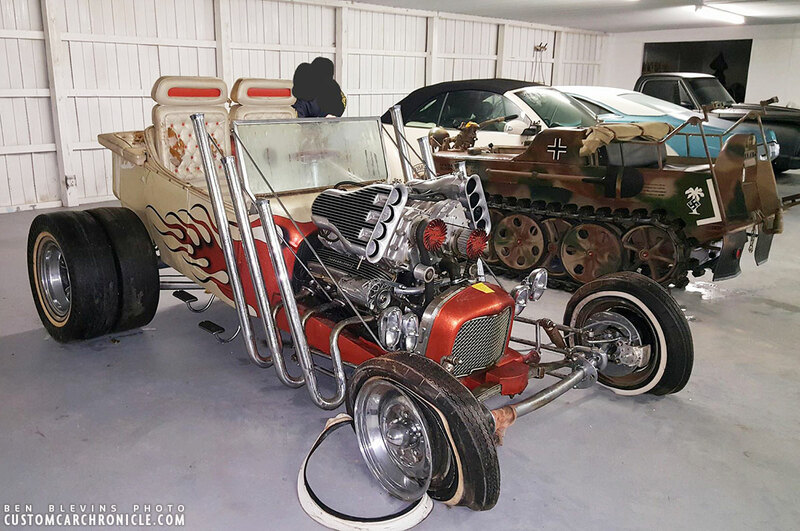 Wow, big chunk of custom car history. Great pictures and story. Sorry to hear of your friends passing. Seems like he was a great guy…not so sure why everyone said he was rude. Perhaps it was their approach toward him? I can totally understand why Jim didn’t want to show the car in the condition it was currently in. 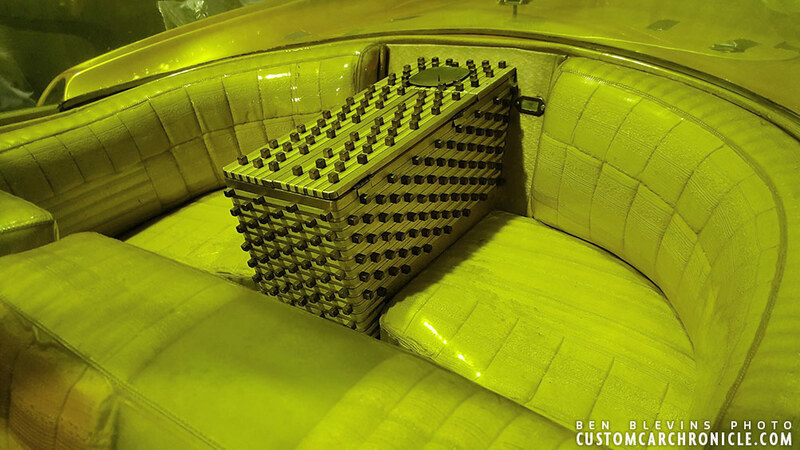 Going from promoting the kustom in its heyday with a suit on, showing all of its gadgets…to having it safely tucked away but in lackluster condition. In a weird way, it makes sense. Jim seemed like a guy who wanted to present it in its best condition, how it was intended to be. He lived the car’s history right alongside of it and probably only saw it one way. Not to mention all of the memories he had along the way. It will be interesting- and a little bit stressful- to think of where it will end up. I hope a guy like Mark Moriarty or Dave Shuten ends up with it! You got that right Rob. That was the reason why it was safely stored away. This is not the original Kookie car. 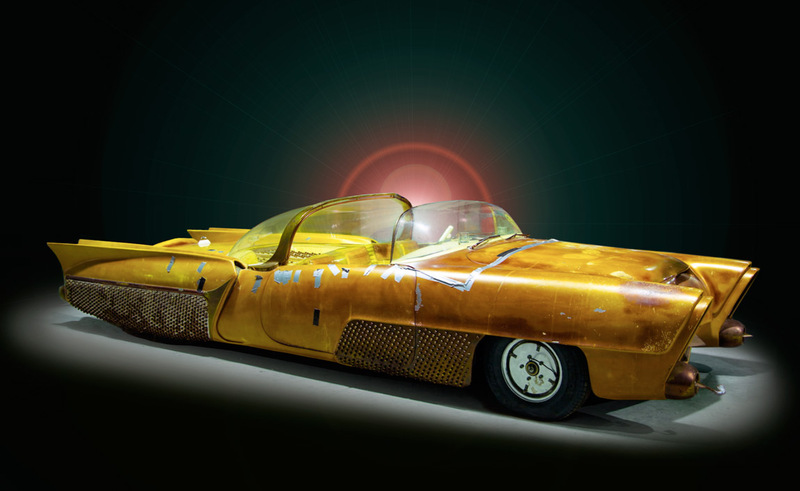 Check out photos of original and this one.Norman G. created the K car and this is not it. Barry,this is the car with a lot of modifications.I had been around this car from the day one Jim bought it.It was the second redoe of the car,Rik probably has the pictures.Russ George Jr.
I’ve know Jim since I was 10 years,I’m 72 now.Jim and my dad were best friend,dad even traveled with him for a couple years and did a lot of work on both cars.Jim was way ahead of his time.If these two cars were built today they would still be in style.I’m going to miss him,the last couple of years him and I talked almost every week. Just like Russ says Jim was way ahead of his time and we also talked evey week too. We were going to go out to eat when he got out of the Hospital Jim was a very smart man.I alway told him he reminded me of Howard Hughes lol. And Sally is a angel ! I sure will miss him to. RIP Jim . I would have loved to see Jims entire car collection! The DVR is all set to record the whole auction so I can see the whole collection. Thanks for the articles Rik. Nice coverage on the Street collection, and great book you wrote on the Stewart car as well as the Street interview. Publishers, and journalists have attempted interviews, and photo archive his collection of vehicles, guns, and life for many years. Good that you were somehow able to somehow connect. Long time friend ( since early 60’s ), difficult to read and know, and for many years struggled with medical issues, hated getting old, and suspicious of everyone…….but pretty much an all around good guy, and will be missed. Hi. Im trying to get in touch with Sally. Jim was my godfather and when my dad, his best friend passed in 2006, i was never able to get in touch with them again. I tried last year, and now its too late to see jim, but hoping Sally is still in ohio. As im in florida. P.s. i have kookies comb, from playing and sitting,in the kar as a kid,lol. There is alot that didn’t get auctioned. It’s a shame that anything got auctioned off at all sad!!!. He will be missed. Rip Uncle Jim. I was going through some old car stuff and found a black and white post card of your uncles car. It’s really cool and it’s got his info on the back of it. Started looking into it and found really great info and wanted to share the post card. Have a great day and hopefully someday I can send a few photos of it.